Cupid has been working overtime in my family and social circles of late, and the result has been a flurry of weddings, receptions, save-the-dates and, of course, wedding gifts. Since I see everything in life, including wedding gifts, through a gardening lens, I thought I would share 5 Garden Inspired Wedding Gift Ideas for gardeners like myself who want to give something personal, something memorable, and something designed to celebrate gardening and the great outdoors. 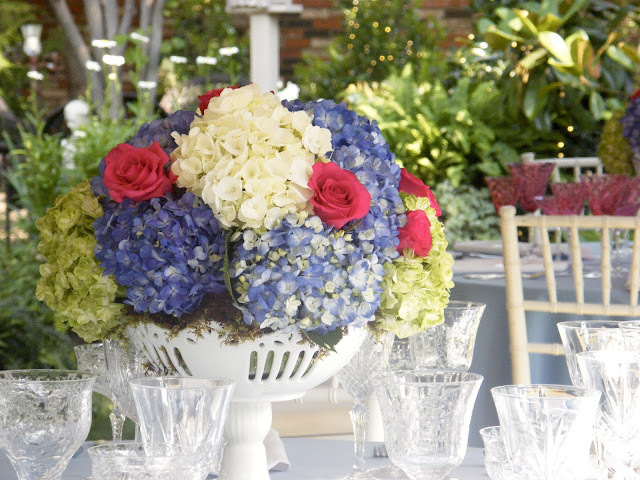 Gorgeous hydrangea and roses take center stage on a rehearsal dinner table in the garden of a friend. (This was also the topic of last Friday's 4 YOUR GARDEN (HERE) segment. Watch it and past segments here). Here's a rundown on some gifts I have given in the past...and no doubt will give in the future. As long as romance is alive, so to speak. Rustic or refined, vintage or new...a picnic basket for two or more, is a wonderful and unexpected gift that goes beyond the wedding registry at the mall. 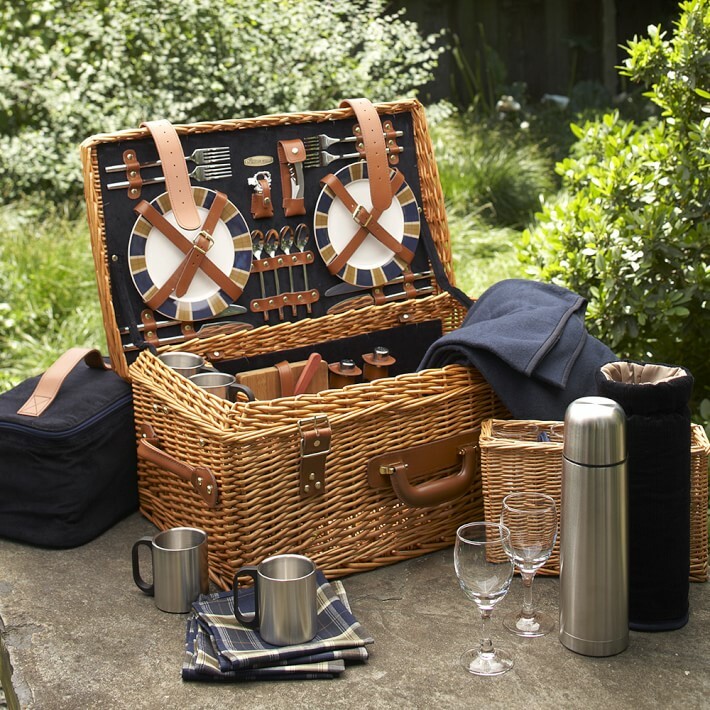 Like this one tricked out to the max, from Pottery Barn here, or this great variety of picnic ensembles at Picnic World (here). Flea markets and antique shops are great places to source old-fashioned and retro versions that you can personalize and stock yourself. Romantic? I think so. 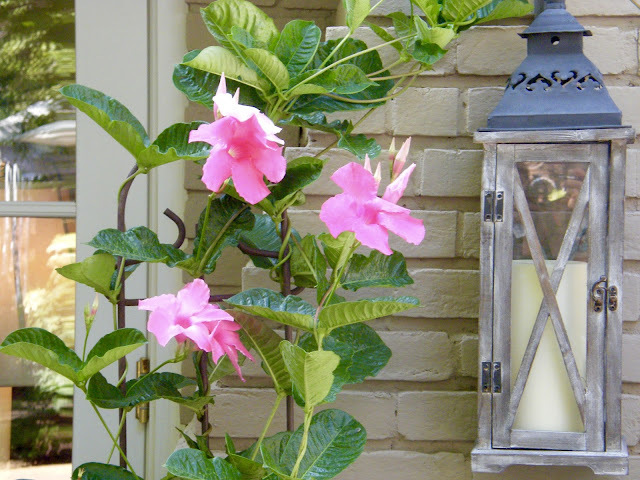 Galvanized metal lantern hangs next to the doorway and hot pink Mandevilla vine. 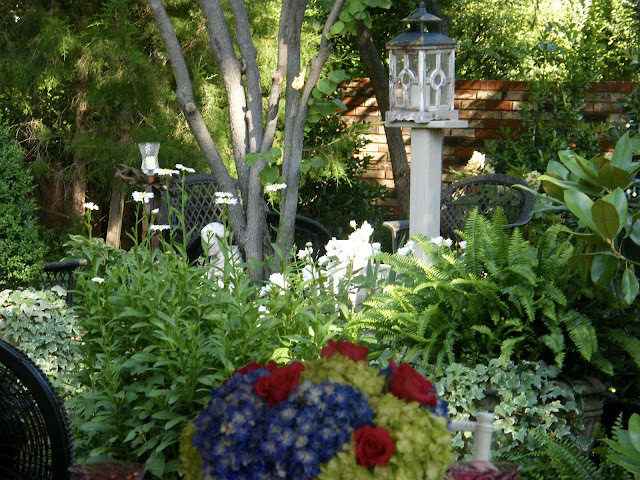 This special outdoor lantern sits atop a post amidst flowers and foliage in the garden. AMAZON (HERE). Guaranteed to continue flickering even in strong Oklahoma wind. 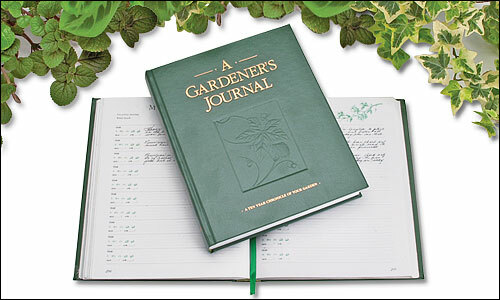 Leather bound ten year journal from Lee's Valley makes a great wedding gift. Two Raised Bed Planters grow herbs on the patio. Farm fresh produce from your CSA. that will provide garden fresh produce without their even getting their hands dirty. In OKC consider GUILFORD GARDENS & KAM'S KOOKERYor LOCAL HARVEST (HERE). If the couple doesn't have time to cook, but love the indulgence of fresh flowers in their home year round, why not get them an annual subscription to a service like BOUQS (HERE) or a local grower from your Farmers' Market. Options that are cut flower beautiful, but with a garden bouquet aura. Fresh Cut flowers from the garden, destined for the vase. Very romantic, and I think, very wedding appropriate. 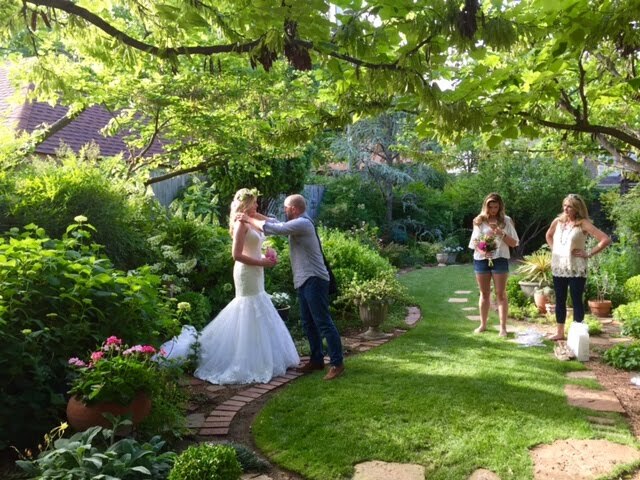 One of several wedding photos taken in my back garden.